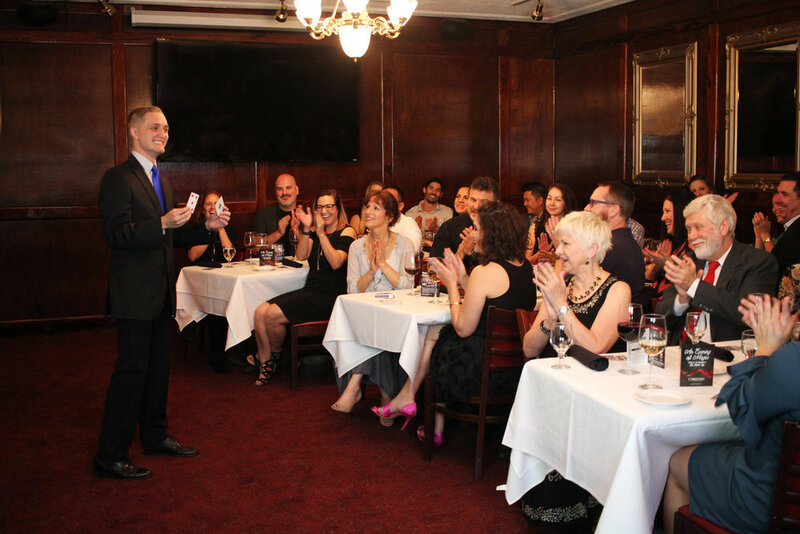 In addition to these ticketed magic dinner shows, our magicians also perform complimentary tableside magic at Christner's every Saturday, 7-9pm. Give your friends, family, or colleagues the gift of magic with a gift certificate they can use to attend a future show. Your recipient will receive a voucher—and be able to select which ever date they’d like. Experience an Orlando dinner show unlike any other—a full-evening, four-course dinner and magic show performance that will delight your intelligence and your tastebuds—all at Orlando's finest steakhouse, Christner's Prime Steak & Lobster. Founded by Kostya Kimlat and starring his See Magic Live team of magicians, An Evening of Magic is a perfect way to celebrate a special occasion or simply enjoy an elegant evening out with your friends and family. Because of the sophisticated nature of the evening, and the thought-provoking magic, the show is best suited for adults, teenagers, and children ages 10 and up. Get ready for an entertaining evening of fascinating mysteries. 6:30: Doors Open. Arrive early and grab a drink while being entertained by interactive, table-side magic. 7:30: Opening Magic Show with your first entertainer, this 25-minute magic show will astound! 8:30: Feature Magic Show with unforgettable magic that will leave you speechless, featuring the evening’s second entertainer. An Evening of Magic takes place monthly in a private parlor environment at Christner's Prime Steak & Lobster, winner of multiple dining awards year in and year out — like Best Steak, Best High-End Steakhouse, and Best Wine Selection. Since 1993, Christner’s Prime Steak & Lobster (formerly Del Frisco’s) has been legendary for mouthwatering steaks, seafood and their down-home hospitality. Ask the regulars who come back over and over, or the first time guest who discovers that a meal at family-owned Christner’s is an exquisite dining experience. Or better yet, see for yourself how high standards of quality and old-fashioned hospitality are part of the Christner family heritage. Homemade delicacies set the pace – each meal at Christner’s Prime Steak & Lobster begins with piping hot bread and personal touches continuing throughout. From the salad dressings to signature dessert, each ingredient is carefully selected with a serious focus on beef. Every serving is corn-fed, aged in house and cut fresh-to-order. Christner’s boasts a wine portfolio of over 4,500 bottles while the drink profile is rich in imported and locally crafted whiskies, spirits and beer. If you or one of your guests has any special dietary needs (i.e. vegetarian, no shellfish), please let us know before you arrive. We are happy to accommodate your wishes when possible. It will be easier for us to accommodate you when we know ahead of time. You may order additional items not included in the prix fixe menu, such as alcoholic beverages or additional side items, entrées, and desserts. These additional selections will be placed on a check provided to you at the end of the evening by the serving staff. Each dinner show performance typically features Kostya Kimlat in addition to at least one other team magician from See Magic Live. Seen on local and national television, this team of talented performers brings the best entertainment to Central Florida. Celebrating a company milestone? Ready to mix up the annual holiday party? Marking a milestone anniversary or birthday? Host your own private dinner show at Christner’s for your celebration of up to 50 guests. Our magicians work seamlessly with the staff to create a perfect evening. Thank you for your request! A representative from Kostya’s booking team will be in touch with you soon. Thank you! We’ve added you to our e-mail notification list for future shows.